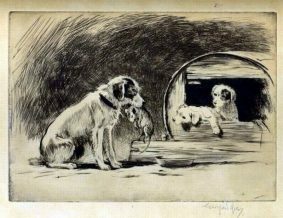 CHARTERPRINTS is well known for its eclectic selection of original prints plus a few watercolours and drawings. Eddie Biggs owns the company. He has been a member of the fine art fraternity for more than 40 years. Since selling their gallery in Birmingham, Ed and his darling wife Sandra have retired to the Black Isle, in the Highlands nr. the pretty little village of MUNLOCHY. Most of the stock is re-mounted (re-matted) using only museum quality board, some pieces then returned to their original frame. To see what we have available, please click on ARTISTS, above. When enquiring please be sure to ask about shipping. Have a look at our fantastic prints by George Soper. RETURN TO WORK by George soper. Etching from c.1920. Signed in pencil. Fine condition. 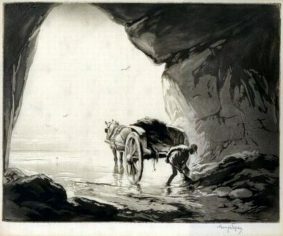 GATHERING SEAWEED IN A CAVE ii by George Soper. Etching & aquatint from 1922. Signed in pencil. WEST HIGHLAND TERRIER WITH A CATCH FOR THE PUPS by George Soper. 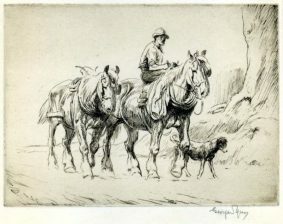 Drypoint from 1927. Signed in pencil. 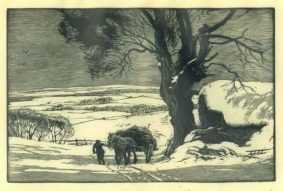 A WINTERS MORNING by George Soper is an original woodcut from 1940. CHARTERPRINTS 2018 CREATED BY Amplify ONLINE MARKETING AGENCY.